I love handbags. In fact, I would say I have an obsession with them; though I don't buy them as often as I would like. That's why I am in love with these adorable paper purses! 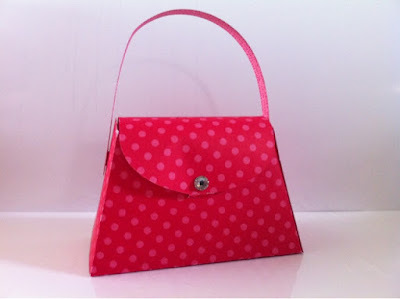 The first is made using the new Petite Purse Bigz L Die, for the Big Shot, from the 2012-13 Summer Smooch Sneak Peek. I absolutely adore this cute little purse. The best part is you can accessorize it any way you'd like! Leave it plain or bling it out, it'll look great no matter what you decide! How great would these be as shower or wedding favours? Fill them with some candy or chocolate and they make the perfect "thank-you" gift. 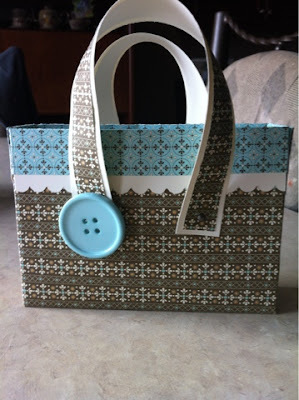 The second purse is made using a 12x12 sheet of DSP (designer series paper) and a sheet of accenting 8.5x11 card stock. It can be used to carry cards to and from events or why not fill it with handmade cards and give it as a gift?